And if you asked Paul where he got the list, he might suggest you add the phrase just as Christ after each item. This is the short list of all God through Christ has done for each of us. When we decide to love as Christ loved us, it will look a lot like the items on Paul’s list. He simply teased out specific applications of Jesus’ new command. His single command designed to serve as the overarching ethic for his ekklesia. “Love one another, just as I have loved you” (John 15:12 NASB). Imagine a world where people were skeptical of what we believed but envious of how well we treated one another. Imagine a world where unbelievers were anxious to hire, work for, work with, live next door to Christians because of how well we “one-another” one another and how well we “one-another” them as well. Once upon a time it was so. Once upon a time the one-another culture of the church stood in sharp contrast to the “bite and devour” one-another culture of the pagan world. Within that context, pagans found the church to be somewhat irresistible. This was especially true for women, children, and the economically disadvantaged. What was true then should be true today. Paul’s one-another list should epitomize the reputation of those who call themselves Christians. When people outside the church think about folks inside the church, the items on Paul’s list should come to mind. We should be the best neighbors, employers, employees, friends, partners, and coaches in the community. Everybody wants to be one-anothered. Everybody wants to feel included in a community characterized by one-another love. The one-another way, the way of Jesus, appeals to something that resides in the soul of every man, woman, and child. The one-another way appeals to our desire to be included, recognized, and loved. So, what if we just did that? 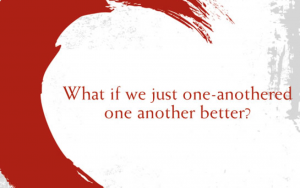 What if we just one-anothered one another better? After all, Paul said, “The only thing that counts is faith expressing itself through love” (Galatians 5:6 NIV). Consider encouraging everyone in your church read Irresistible. It will show you how to embrace the original version of your faith—the version credited for turning the world upside down. 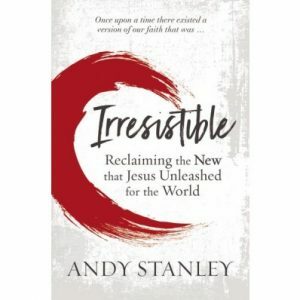 Irresistible could be the most important book your church reads this year. Get copies of Irresistible today.